Cavewoman and I were at our local Estee Lauder counter last week. We were checking out the new Tom Ford products when we spotted the High Gloss display. I pointed these glosses out to her because I am currently obsessed with them. High Gloss are sheer lip glosses that leave no grit or sticky mess on the lips. They also leave a very pretty sheen to the lips that look great alone or mixed with other lip products. These are all wonderful and winning characteristics but this is not why I love them. The reason is the scent. These glosses smell so darn amazing. They are scented with vanilla and fig. I am not normally a vanilla fan but the mixture with the fig is fabulous. The kind of fabulous that you want to bathe in it. Lets hope there is a fragrance in the works based on this. It is that good!!!! They are available in a host of colors. Standouts are Pearl(stunning and my #1 pick),Blush,Honey, Coral, Amethyst and Rose. Let me know if you check these out and what you think! Ooooh...this is something I will have to check out! I'm not a huge fan of lip glosses because of the stickiness, but a sheer glossy lipstick? That I will try...now, if only I could make it last for more than a couple hours...! DailyO: These are sheer glosses. They are less sticky than Chanel Glossimers and Too Faced. They are worth a try! Remember to sniff them to smell the figs! tessa: This is a great fig too. Not as dry as some fig based fragrances. I was just working on a post about this. I'm so in love with this gloss. I need to find a picture of it online. Good color choices too! I could not find any good photos online. I decided to go with Harlow. 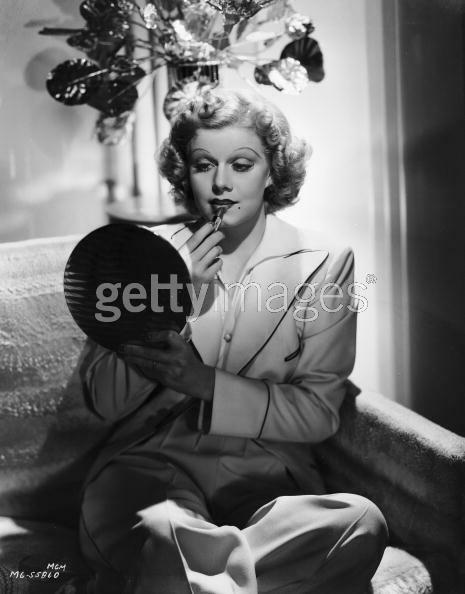 You can not go wrong with a Harlow picture. Remember the doomed Underground Scent Plant? She had a Vanilla Fig Cedar that had a lot of fans. I had a bottle, and it seemed like a good idea but one that needed some serious filling in and polishing. I wonder if these glosses smell like a better version of that. tbone: You have to go and try these glosses. It is worth a visit to Saks. Hug John Henry for me. Get a picture of him. I would love to post him on the blog. I just got off drbaumann.com. It's a great site for skincare/makeup info. It's run by Dr Leslie Baumann who wrote The Skin Type Solutions. I may have mentioned her book here before. Anyway, you can have Dr Baumann respond to you directly about your skin or the right makeup products for your own skin type. Saves a lot of time and money when you purchase products that work for your skin...instead of against it...ugh! I absolutely LOVE these glosses! My mom and I went to an Estee Lauder event, with the makeup artist Alex something, and I swear I was ready to bite his hand hen he was applying this on my lips!!! My mother and I each bought one, Rose for me and Blush for her. I am hoping that they expand on this line and launch new colors. It is a great product!!! !